After George Joestar confuses the thief robbing him after a carriage accident as his savior, he promises that man he will do anything for him. Years later the man sends his son, Dio Brando, to be raised by George Joestar, along with George’s own son Jonathan. I don’t see anything going wrong with this. 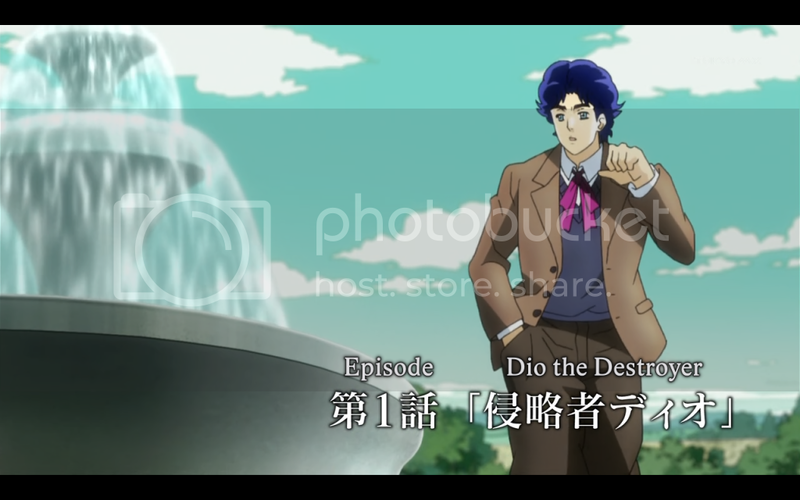 As soon as he arrives, Dio makes Jojo’s life a living hell, to drive him out and make himself the heir to the Joestar estate. 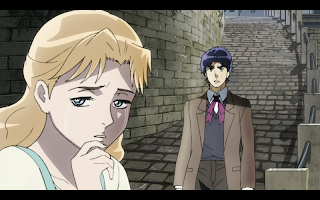 He physically abuses him, steals all his friends from him, and even steals her first kiss from Jonathan’s girlfriend. 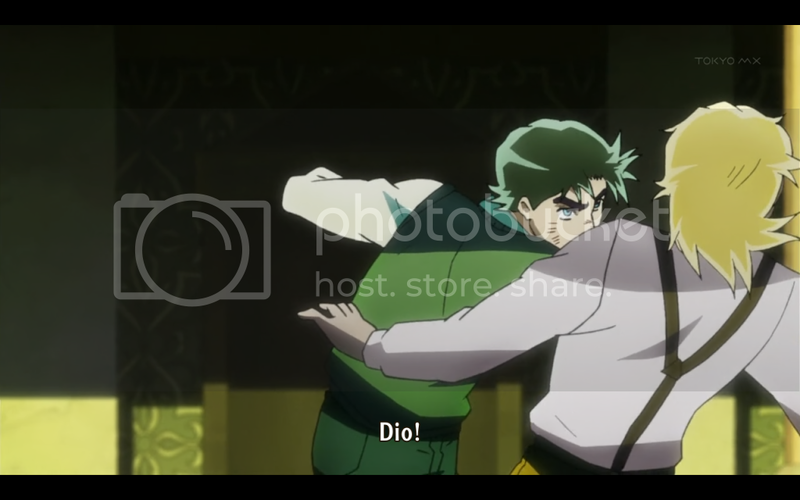 Enraged by this assault, Jonathan attacks Dio, and beats him for the first time. Their fight is interrupted, and in retaliation Dio has Jonathan’s dog, Danny, burned alive. OPEN THE DOOR YOU IDIOT! Before we get into this, I’d just like to say that I love JoJo’s Bizarre Adventure. When it comes to stupid awesome action there’s no series better, and I love how the story spans multiple generations. That being said, this first episode is very faithful to the original source material. Which…isn’t necessarily a good thing. 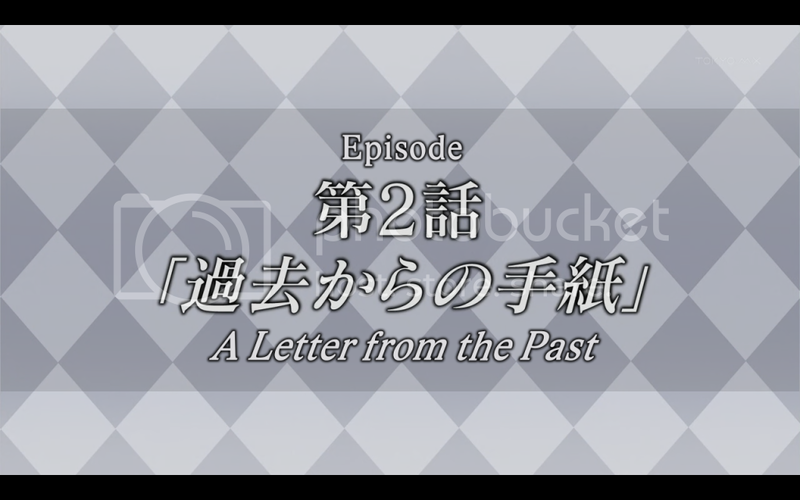 To be fair, and I think most reasonable fans of JoJo’s Bizarre Adventure would agree, the early chapters of part one are not the most stellar example of the series. It’s an odd phenomenon in manga, where they run long enough that the manga artist gains a lot more experience over the course of writing the same series. Resulting in an amazing series that has a pretty awful beginning. This will not be his last case of animal cruelty. My biggest concern with this first episode was how childish it was. 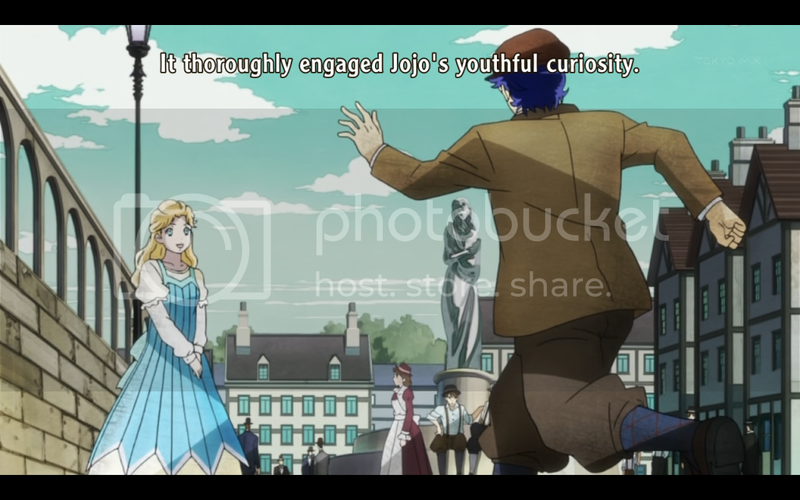 Granted, Dio and Jonathan are both twelve years old, and it is their prerogative to be childish. However, it’s not just the characters that are childish, it’s the writing itself. 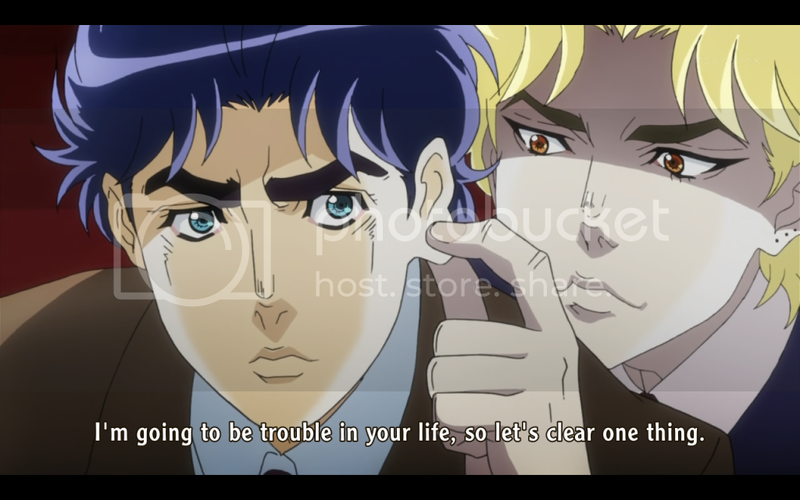 Dio’s grand master plan is to make everyone hate Jonathan by…telling them Jonathan can’t keep a secret. And despite the utter stupidity of this plan, it actually works! The side characters, including George, are all complete morons that fall for Dio’s lies in ways that aren’t even close to realistic. 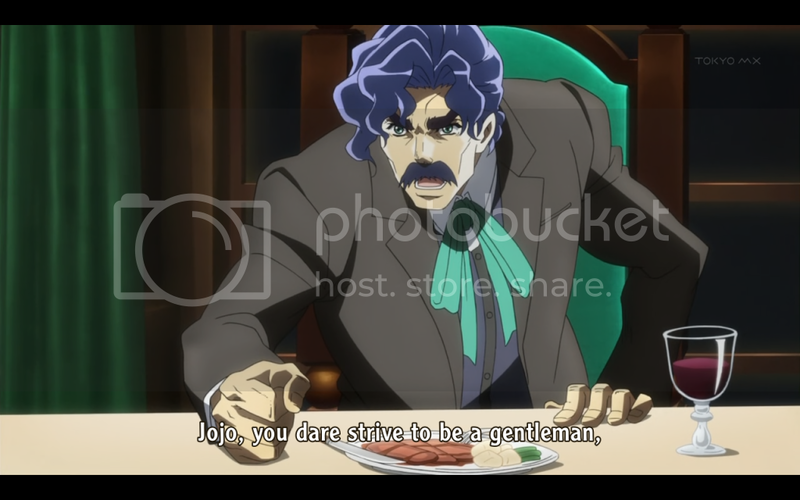 Dio’s deception of George makes at least more sense, because he makes himself look perfect. But all of Dio’s cronies come across as tools for the plot, rather than actual characters, and the story as a whole comes across as weaker because of this. And it works! 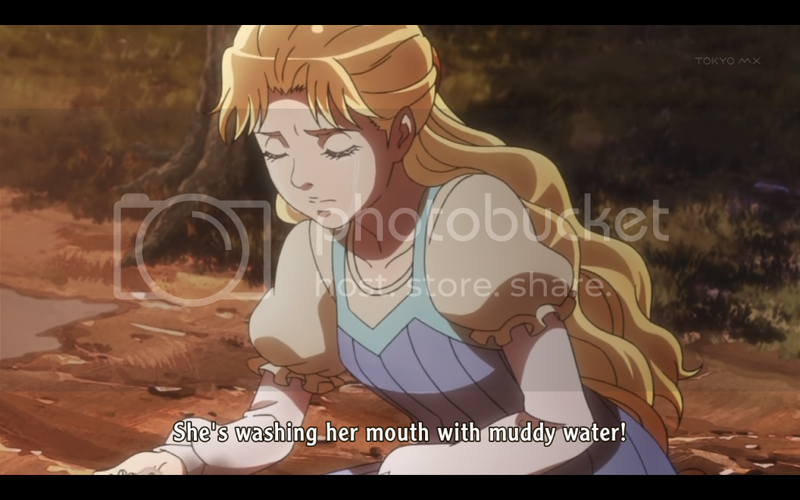 Having her first kiss stolen actually makes Erina avoid Jonathan. She did nothing wrong! Why is she feeling guilty!? It’s all too obvious that this was written back in the mid eighties. However, I will say that after this episode is when things actually start getting interesting. I wouldn’t be surprised if this episode drove people away, it’s generally distasteful, and focuses far too much on the bullying. 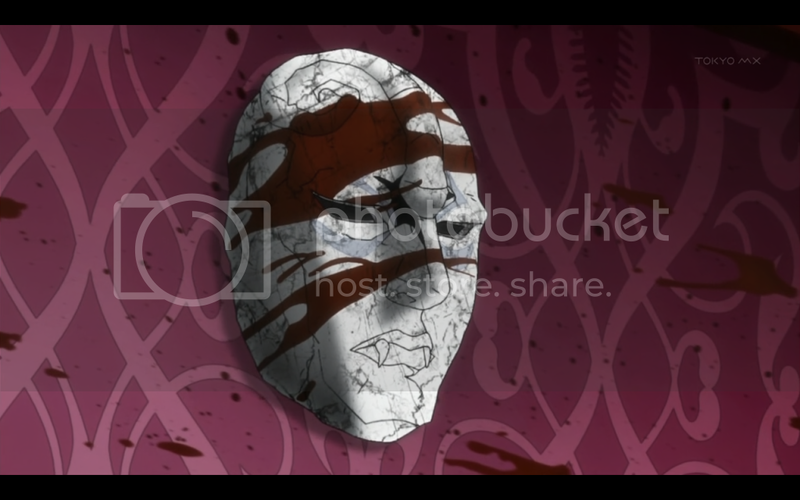 Those that aren’t repulsed by the bullying will be repulsed by how shallow and melodramatic the characters are. Though the fallout is satisfying. For those that haven’t read the manga, and who don’t think they’ll be continuing with the anime after this, don’t worry. It gets better. It never really stops being stupid, but it becomes stupid in the most glorious of ways. And if this first part succeeds, we’ll get the rest of the series animated. Which is where it really becomes excellent. On the technical side, to borrow a phrase, the art is very pretty, and the animation is top notch. There’s a lot of focus on style over substance with some presentation choices. Which suits this franchise well, as a good majority of the series is all about style. Some of the more ridiculous aspects of the original manga are toned down. 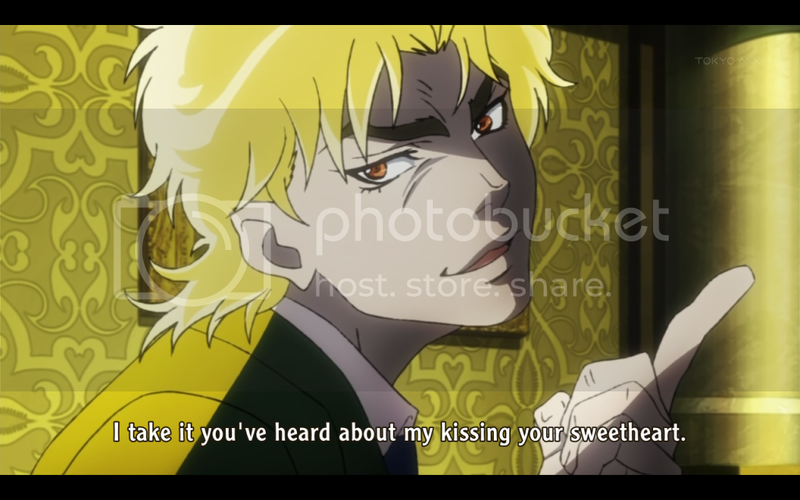 Such as Dio and Jonathan actually looking like twelve year olds. Buff twelve year olds, but not to the point of the original manga. Unfortunately the same can’t entirely be said for the background characters. Most of them are toned down as far as musculature, but their faces still look like they belong to much older characters. In a sense, JoJo’s Bizarre Adventure tries to adopt the mentality of “everyone is a horrible person” that so many seinen series I hate do. However, because it was originally a shonen series, it can’t go quite all the way. Thanks to that, and the overall, wonderful ludicrousness of the entire series I can say that I do think that latter episodes will be much better than what we got in this first outing. From what I’ve seen in this first episode I can tell that we’re moving through the plot at a fairly brisk pace. So it won’t take too long before we get to the good stuff. I wanted to give it a three out of five, but there was too much I didn’t enjoy that I couldn’t really give it that high a grade. I imagine this will be the lowest grade I give this entire series. While I do respect the fact that you were reviewing this episode as objectively as possible, I have to chime in and point out a few things. 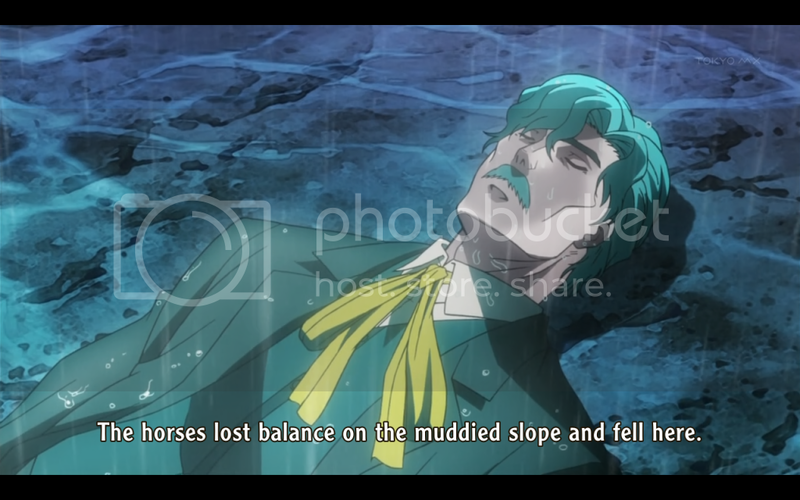 You say that it is unrealistic for any of Jonathan's friends to fall for Dio's lies. Sure I would agree to this as well but then again, Araki is the type to do his research on cultures before writing stories revolving around them. Maybe it is unrealistic to any of us in this day and age but British people were more superstitious back in the 1800's and if you have this one guy who was capable of doing all these great things, then it wouldn't be out of the question for the general public to express interest of some sort towards him. So, by this, I can't call Dio's plan completely unrealistic if I don't know anything about British culture and superstition in the 1800's. As for the scene with Erina ignoring Jonathan out of guilt after being kissed by Dio, that was more of a status issue than anything. I know that today's women wouldn't take a inadvertent kiss lying down but things were different back then. If a British woman was to be kissed inadvertently by a man who she despises, She could end up feeling guilty over it. I'm not trying to be offensive here, I'm just pointing out different mindsets and beliefs that took place back then. Feel free to clarify anything if I'm wrong. I seriously amazed to see your post and images as well also just ordered my Jojo's Bizarre attacking figure and PS3 DVD from PIJ. I hope will get this in a week. This anime series really awesome and I think this will enjoy very much. Thanks again for your nice work.